The pressure cooker that has come to encompass a plan to destroy the Promenade and build a “Highway in the Sky” cheek-by-jowl with the western edge of Brooklyn Heights is getting even hotter. City Comptroller Scott Stringer confronted Mayor Bill de Blasio and Department of Transportation (DOT) Commissioner Polly Trottenberg with criticism about the city’s process, residents are asking “where’s the outrage” from local officials, and bloggers are pitching ideas that would protect the passionately adored Promenade. The Brooklyn Heights Association and A Better Way NYC are aggressively raising money to suggest and develop alternate plans, as well as go to court if necessary. At the same time, Laurie Garrett, Pulitzer Prize-winning author on global public health, says replacing the Promenade with six lanes of traffic will expose the neighborhood to a toxic stew of micro-sized particles that could cause cancer and heart disease. Currently, the overhang of the Promenade partially protects Heights residents from plumes of PM 2.5 particulates, she said — but that will change if the BQE is brought up to garden level. The city’s DOT “has failed to engage the surrounding neighborhoods in a constructive manner, has not been sufficiently transparent regarding alternatives to the current project, and has ‘eliminated several alternatives from consideration’ in a cursory manner,” Stringer wrote to the mayor on Dec. 17. Stringer said he is also concerned that the city’s controversial plan may be at cross purposes with other city initiatives and goals, including: $100 million in freight-rail improvements that would reduce truck traffic on the BQE; congestion pricing, which would also reduce traffic on the BQE; and the city’s commitment to reduce greenhouse gases. He said he was very concerned about the long-term environmental impact of the city’s proposed plan. Of the two plans put forth by the city, one is a more traditional, lane-by-lane approach that would take longer and cost more, DOT says. The “innovative” method preferred by the city would create a temporary highway on the Promenade while work is done below on the existing two levels of the BQE. 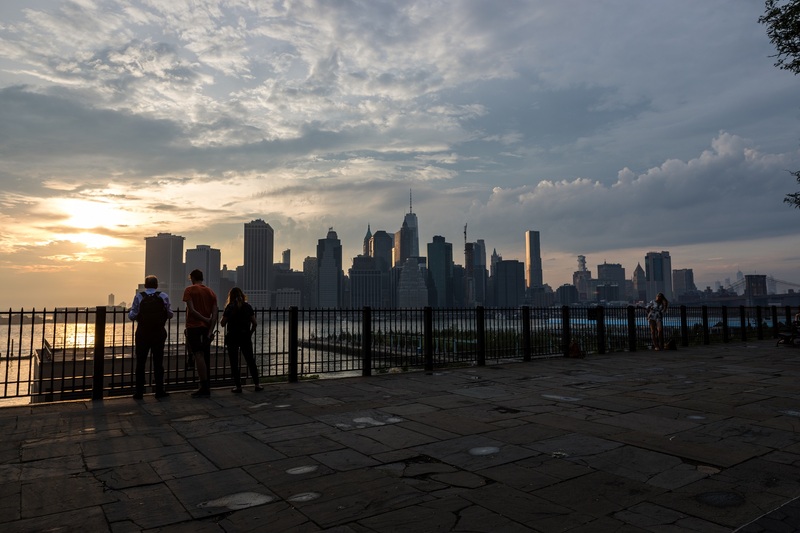 To save the landmarked Promenade and divert pollution from the residents of Brooklyn Heights, the Brooklyn Heights Association has developed a plan that would run a temporary BQE along the edge of Brooklyn Bridge Park, far below the Promenade. DOT says it is considering the plan along with other alternative ideas. A long-time resident who blogs under the name Sam Howe has suggested that the Promenade only needs repair, not demolition, and as a city park, it should fall under the purview of the Parks Department. “Let’s separate the Promenade from the rest of the re-build project,” he suggests in his blog Howe’s Brooklyn. “Even opponents of the city’s DOT plan say there are some really smart engineers working there. Let them figure out how to separate the Promenade, shore it up and leave Park Department to cope with repair in the ensuing years,” he wrote. Another blogger by the name of Vanshnookenraggen suggests the BQE wouldn’t have to be replaced if the MTA rerouted subway lines. “The DOT’s own numbers tell the tale. Up to 2/3 of the traffic using this section of the BQE are intra-borough trips (this is car traffic, not truck …),” Vanshnookenraggen wrote. “If the BQE was shut down without a complicated second highway to pick up the current traffic then large portions of users could switch to mass transit.” Vanshnookenraggen outlined a plan where B,D,N,Q, and R trains could be rerouted to improve service. And forward-thinking experts, including Garrett, say the city should strongly consider eliminating or reducing the footprint of the BQE altogether as it moves to reduce traffic through congestion pricing and alternate transportation ideas. A Better Way NYC, whose members say they are concerned by what they perceive as lack of urgency from local officials over the issue, applauded Stringer on Friday for calling on the mayor and Trottenberg to “revisit the flawed process” behind the proposed rehabilitation. “Elected to ensure the City’s efficiency, integrity and performance, Comptroller Stringer is demonstrating the bold leadership that New Yorkers deserve by calling on the DOT to revisit the flawed process behind the proposed rehabilitation of the BQE,” Hilary Jager said in a statement. Assemblymember Jo Anne Simon, Councilmember Stephen Levin, state Sen. Brian Kavanagh and U.S. Rep. Nydia Velázquez emphasized to this paper that they have met with members of A Better Way NYC in addition to holding numerous meetings with local constituents and government officials. They released an update on their progress on Friday, saying that both of the options the city has proposed so far “would have significant and profoundly problematic impacts on the communities we represent,” and that all “plausible alternatives” need to be fully considered before the project receives federal, state and city approval. “We appreciate that DOT has agreed to examine alternative solutions beyond the existing proposals, including a thorough analysis of the Brooklyn Heights Association’s proposal,” they wrote. New York State’s draft environmental impact study of the reconstruction of a 1.5-mile section of the crumbling Brooklyn-Queens Expressway (BQE) did not review the plan that the city’s Department of Transportation is now backing. The extensive study for the state’s draft EIS compared 12 alternative methods to rehabilitate the BQE section from Atlantic Avenue to Sands Street. This includes the triple cantilever underpinning the Brooklyn Heights Promenade, and is traversed by roughly 154,000 cars and trucks a day. The review of alternatives was carried out jointly by NYS DOT, the Federal Highway Administration and the NYC DOT and was published January 2011. The study, which included input from stakeholders and a technical advisors, considered rerouting the BQE various ways, including through tunnels. Ten of these ideas were discarded for various reasons, mostly based on technical feasibility. Neither of the two “winning” options included the controversial method the city is currently backing. This so-called “innovative” method would replace the historic Promenade with a temporary six-lane BQE during 6 to 8 years of construction costing $3.4 billion or more. The other option DOT says it recently considered would be a traditional lane-by-lane replacement project, which would involve extensive nighttime and weekend work. DOT says this method would take roughly two years longer and cost appreciably more than the innovative method. While the city, including Mayor Bill de Blasio, is backing the Promenade-replacement plan, it was conceived and presented without the extensive review carried out by the state in its initial study of alternatives. “Mayor de Blasio blindsided the Brooklyn Heights community … by supporting the temporary six-lane highway at the Promenade,” the Brooklyn Heights Association commented after the mayor’s support was revealed on the Brian Lehrer radio show. The city says it plans a public review process of its proposed plan in the future. The first problem with the initially proposed plan was DOT’s “take it or leave it” approach, presenting it as a this-is-what-we’re-going-to-do plan. No local input. Nothing from local elected officials, nor other engineers or architects. Funny thing, lots of people who can hire lawyers—some in fact are lawyers—live here, and DOT managed to enrage us all. The days of Robert Moses proposes, and NYC says yes, are long over. Architect Allen Swerdlowe proposed a tunnel as an alternative to what’s there now—years ago, before repair became really urgent. His idea was also shot down. At least the DOT plan wasn’t presented to us by Tweet. any tunnel here would have innumerably problems including at least 4 subway tunnels crossing the route, problems with connecting to the Brooklyn and Manhattan bridges as well as water tunnels and other utilities issues. It wasn’t merely shot down, it was studied and found not feasible for at least the over reasons. There would have also been land taking issues as well. Per sidebar: This is why we can’t wait on the DOT Environmental. We need to do our own EIS. Otherwise we are allowing the “fox to guard the henhouse”. Excellent reporting by Mary Frost as usual.